← Pratchett Quote. No 14. The Sinking of News Corporation. Oh joy of joys, The Sun and the Times are now firmly embroiled in the News International Hacking Scandal. Best of all they are not only accused of hacking Gordon Browns phone, and obtaining details about his sons illness illegally, but they are now accused of putting the security of the great British cash cow ‘the royal family’ at risk, by attempting to bribe a royal protection officer. 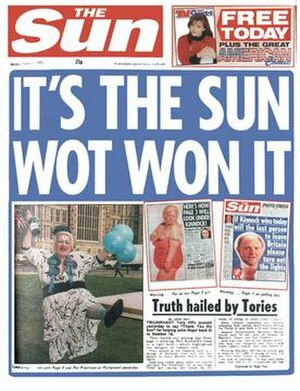 The issue of Gordon Browns phone has the average British news watcher shaking his head disapprovingly, putting royal security at risk will have the traditional working class readership of the supposedly royalist Sun up in arms. I am under no illusions that Murdock is finished yet, but with the News of the World down and out, the BSkyB deal on the ropes, both the Sun and the Times ducking and diving for all they are worth, and the prospect of having drawn Her Majesty’s displeasure things are not looking good. Ed Miliband (Nice but dim) of course was making as much of David Camerons choice of press secretary, (Andy [what hacking] Coulson) as he could, though I suspect Cameron will survive this relatively comfortably in the short term. I’m guessing Nick Clegg will however be breathing a sigh of relief, if not rubbing his hands in glee at the Prime Ministers discomfort. Though how much it will take the pressure of the junior partners in the coalition, remains to be seen. Frankly it couldn’t happen to a nicer bunch of people as they say. The parts of the media not owned by Murdock, (Surprisingly there are some left) are of course going for the kill, naming the Scandal ‘Britain’s Watergate’, always useful to associate wrongdoing with tricky Dicky, though I confess a couple of years ago I would have chosen Gordon Brown, as the prime candidate for something of that ilk. Mostly because he shares Nixon’s electric smile, i.e. on or off like a switch being thrown. That it is: ‘I can turn an election, just by dictating the allegiances of my newspapers’ Murdock, is just too good to be true. The only down side at the moment is that the BBC’s ‘Have I got News For You’ is not on the air, so Murdock et al are being spared, Ian Hislops and Paul Mertons, acerbic wit on prime time BBC 1, and worse, even Private Eye is not due out till the 19th of July, so this entire saga is playing out in a satirical vacuum. Ah well just have to watch it unfold in the proper media, lets hope the entire house of cards collapses in on itself, and that Murdock ends up propping up a bar in Alice Springs, trying to remember the heady days of his success. Oh and just to remind everyone, News international, is owned by News Corporation, of which Murdock is CEO, just to do my bit to keep the ‘News Corporation’ name in the limelight whilst Murdock tries to deflect it anywhere but: even onto the wholey owned subsidiary, News International . This entry was posted in British Politics, News Corporation Phone Hacking Scandal, Politics and tagged Alice Springs, BBC, British Sky Broadcasting, David Cameron, News International, News of the World, Nick Clegg, Rupert Murdoch, Satire. Bookmark the permalink.